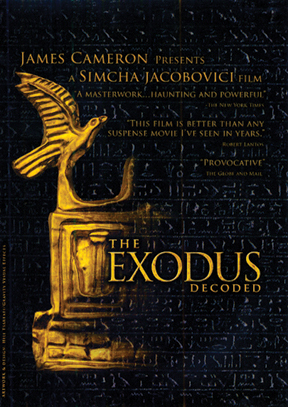 This provocative, historical detective story uncovers, among other archaeological artifacts, a hieroglyphic inscription that tells the story of the Exodus from Pharaoh°s point of view. It tracks down the real Mt. Sinai where Moses received the Ten Commandments, and it reveals a 3,500-year-old gold image of the lost Ark of the Covenant. By synchronizing historical and geological events, the program also exposes the underlying science of the Biblical miracles. Shot in six countries and set in a breathtaking 3D computer graphic environment, the film is a visual feast that is challenging to the mind and uplifting to the spirit. Time: 1 hr 35 mins.